The medievalists at Trinity are committed to communicating their research to broad publics through a busy schedule of public lectures, symposia, exhibitions, online-resources and podcasting. They also seek to provide public advocacy and leadership on questions of public concern, such as archives, heritage and commemoration. 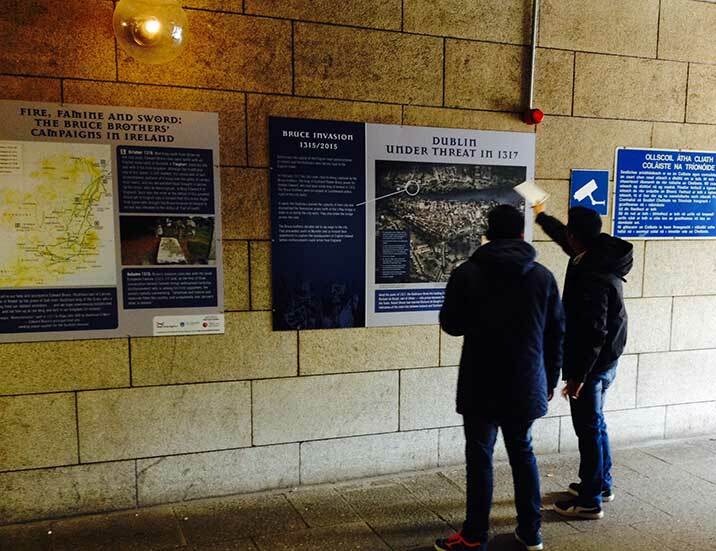 To mark the occasion of the 700th anniversary of the Bruce Invasion of Ireland, MHRC has developed a series of public exhibition panels for display in the public Nassau Street entrance-way to the Arts Building. The panels explain the history of Irish–Scottish relations, the events of the Bruce Invasion, and the dramatic events in Dublin in 1317. Organized by: Dr Peter Crooks, Dr David Ditchburn, Professor Seán Duffy, Dr Caoimhe Whelan and Dr Cherie Peters. Funding: Ulster-Scots Agency and the Arts and Social Sciences Benefactions Fund, Trinity College Dublin. 2015 marks the 800th anniversary of Magna Carta (‘The Great Charter’), one of the most famous documents in world history. To celebrate this anniversary, Christ Church Cathedral has collaborated with Dr Peter Crooks of the Medieval History Research Centre at Trinity to develop a permanent exhibition explaining the significance of the Christ Church Magna Carta, which is contained within the cathedral’s Liber Niger or ‘Black Book’. The Christ Church Magna Carta forms the centrepiece of a new, interactive exhibition in the cathedral crypt, where visitors can view Magna Carta in the original vellum manuscript. 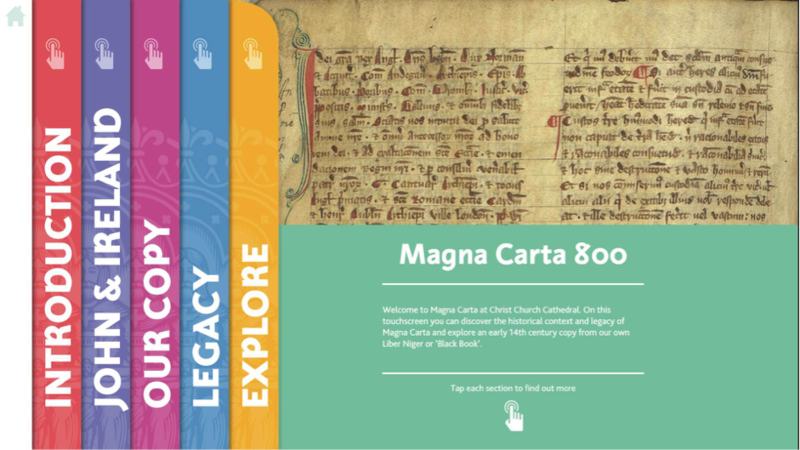 They are also invited to explore the ‘Black Book’ of Christ Church in more detail in an interactive digital exhibit, which includes images of the complete medieval Latin text of Magna Carta and explanations of its most significant passages. 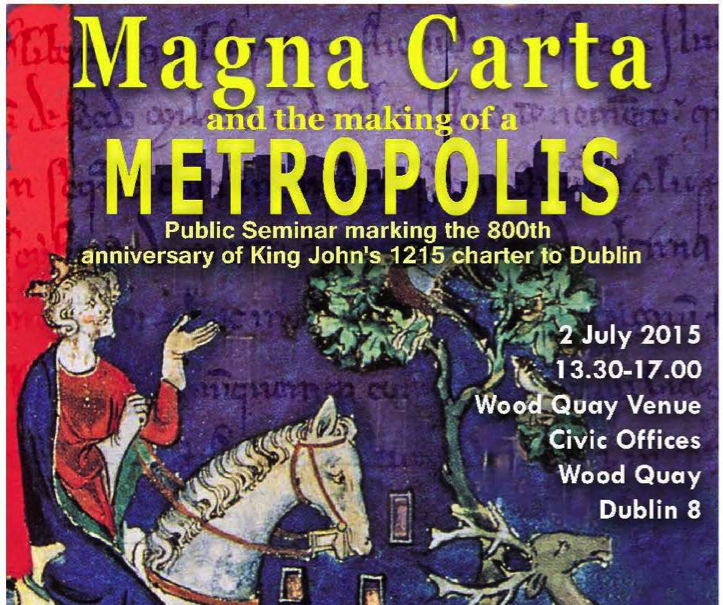 To mark the occasion of the 800th anniversary of King John’s charter of 3 July 1215 to the city of Dublin, MHRC and the Friends of Medieval Dublin collaborated with Dublin City Council to organize a public seminar on 2 July 2015. The event took place at the Wood Quay Venue at the Civic Offices. Speakers included Professor Seán Duffy and Dr Peter Crooks (MHRC) and guest speakers Dr Margaret Murphy (Carlow College) on Archbishop Henry of London and Dr Hugh Doherty (University of East Anglia) on the Magna Carta Project. The event was opened by the British Ambassador. 2014 saw the celebration of an important medieval milestone: the 1000th anniversary of the Battle of Clontarf. 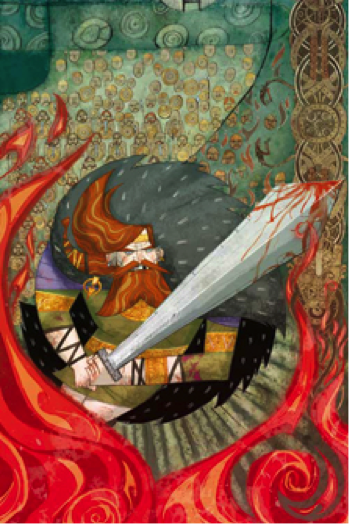 In the popular imagination that battle was the culmination of a long war between Viking invaders/settlers and the most powerful of all Irish kings, Brian Boru. The historical reality was not so simple, and both the history and the legend of Brian were examined in an exhibition—Emperor of the Irish—in the Long Room of Trinity College Dublin, in collaboration with Professor Seán Duffy of MHRC and the National Museum of Ireland. Pride of place in this unique exhibition was given to the only item known to have been in Brian’s presence: the famous 9th-century decorated manuscript known as the Book of Armagh. The exhibition included some of the Library’s greatest medieval Irish treasures such as the Book of Leinster and the Brian Boru harp. The display incorporated large-scale graphics designed by Cartoon Saloon (producers of the Academy Award nominated animated film The Secret of Kells), which were inspired by the exhibition’s themes. 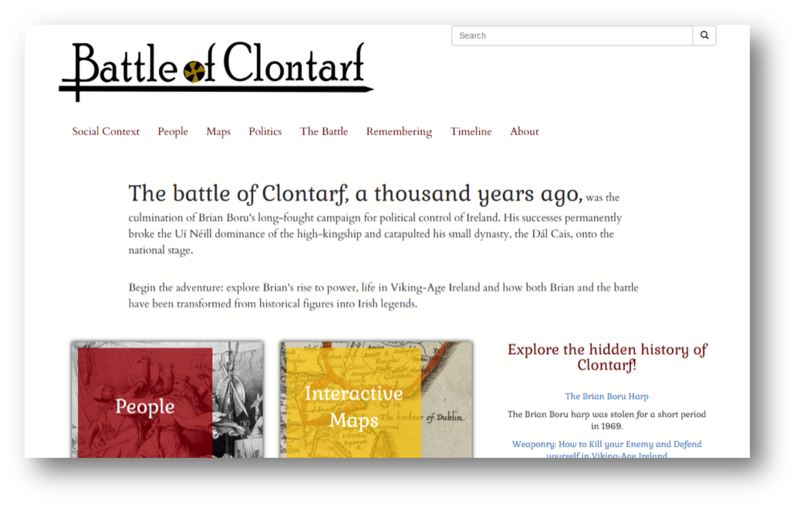 The Battle of Clontarf website was created for students and the public to provide access to historical and archaeological information and resources on one of the most emblematic battles in Irish history. The web pages include sections on social context and daily-life in Viking-Age Ireland; the political background and rivalries that led to the battle on Good Friday, 23 April 1014; and the key figures at the battle. Dynamic interactive maps enable exploration of Viking raids and settlement development, Brian Boru’s military campaigns and what happened on Good Friday, 23 April 1014. In 1922 the bulk of the nation’s documentary heritage was destroyed in the cataclysm at the Four Courts. 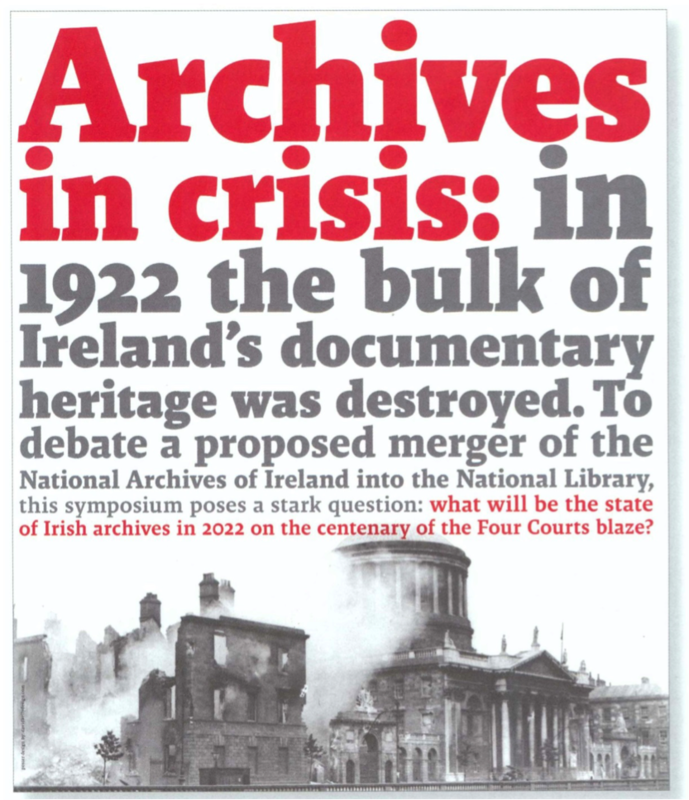 What will be the state of Irish archives in 2022, on the centenary of the Four Courts blaze? This was the stark question posed at a public symposium on ‘Archives in Crisis’ organized by Dr Peter Crooks. The meeting opened with three short papers representing different viewpoints on the current crisis. Catriona Crowe (chairperson of the archivist’s branch of IMPACT) outlined the straitened circumstances under which Irish archivists currently operate. Eunan O’Halpin (Bank of Ireland Professor of Contemporary Irish History at TCD) offered the scholar’s perspective on the crisis, while Fintan O’Toole addressed the cultural significance of archives for Irish society at large. Further information on the outcome of the symposium is available here. The debate was held between four expert historians of medieval Europe, including Dr Fiona Watson, Professor Alexander Grant (Lancaster), Professor Michael Prestwich (Durham), and Professor David Ditchburn (MHRC). Members of the audience had the chance to quiz the panel about Wallace and the momentous decades for Scotland around 1286 to 1306. The debate was chaired by the Presiding Officer Tricia Marwick MSP. Last updated 18 October 2018 medieval.history@tcd.ie (Email).